SIZE: Up to 4 feet tall and 300 pounds. FAVORITE THING TO SAY: Reindeer rock! I am a Reindeer, and I live way up in the North in a cold place called the tundra. I have big, sharp hooves to help me walk on ice and snow. I am related to elk and caribou, but unlike other deer, I can grow antlers on my head whether I?m a boy or a girl. 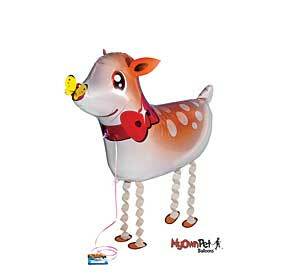 I can?t fly like Rudolph and I don?t have a nose that glows in the dark either, but I can prance and dance behind wherever you go!